Mui, or Cherry Blossom, is a symbol of good wishes in Chinese culture. 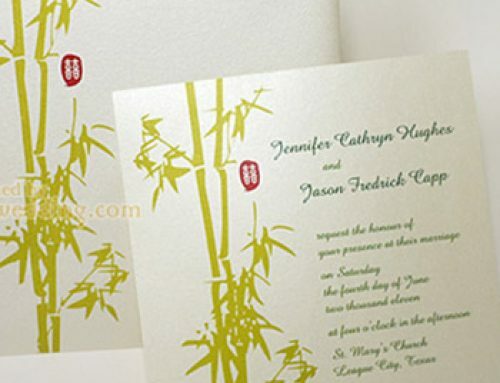 As a result, this pattern is extensively used when it comes to Chinese weddings. Of course it will also be used for wedding invitations. When people get married, they and their family are filled with joy. “Mui” bears the blessing and good wishes in traditions. 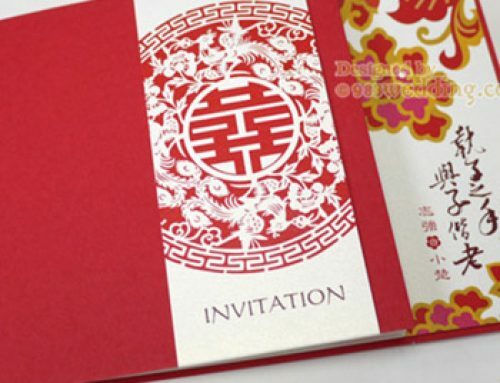 The design of the invitation is totally modern. As a result, we do not use gold color paper stock. Instead, we use some off-white color paper stock. 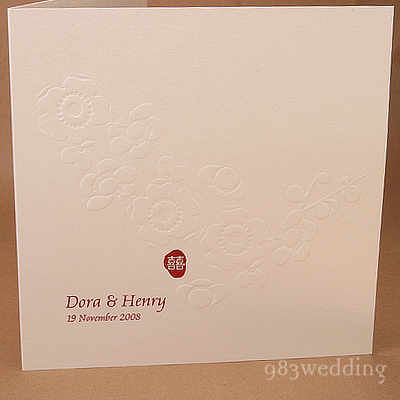 A beautiful creamy pearlized color paper is chosen. In order to deliver a sense of modern look, we aim at making the design clean and simple. As a result, we do not print the cherry blossom in any bold color. We try to make it subtle but elegant. So, we apply the technique of embossing to the design. The cherry blossom pattern is a raised pattern. It becomes a texture coming out of the card instead of a color printed on it. By using this technique, it gives your guests a special feeling of touch when they hold the card in their hands. We have still used a little bit of red color in this design. 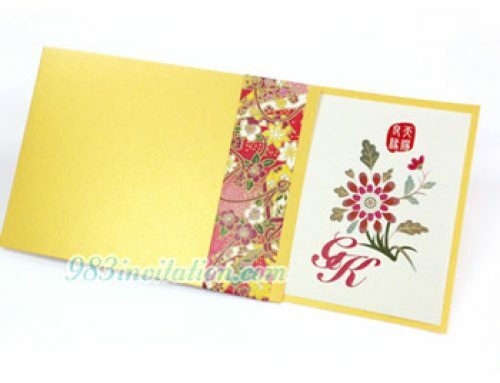 We have printed an elegant and traditional Xi (double happiness) Chinese chop on the card. The chop is not a bit one. It is small but certainly standout becuase the mui (blossom flower) pattern is basically of no color. The name of the couple will be printed beside the chop. This combination generates western-modern Chinese cultural look. 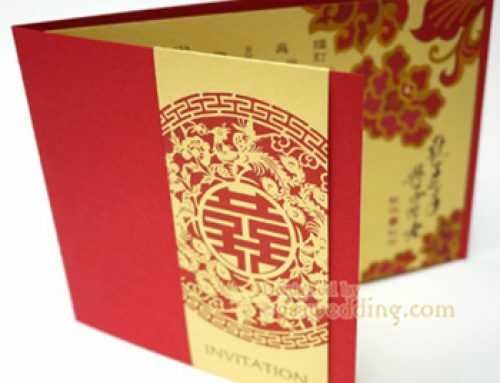 The name and the double happiness symbol are printed in shiny red color with foil printing. This will become the main focus of the card, in terms of color. The date of the wedding can also be printed on the card. It is not a strict design of minimalism but we have borrow some ideas of minmalism to create this card. 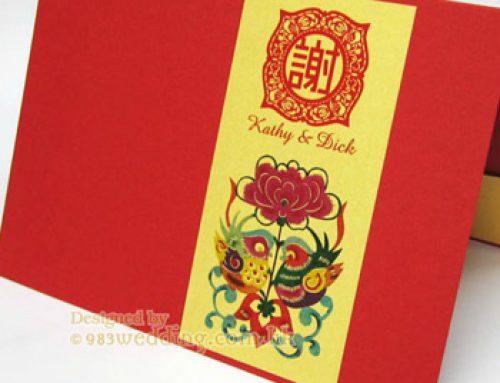 This design will suit brides and grooms who search for a wedding card in modern Chinese style. 1. R.S.V.P. card, place card, menu, church program & thank you card would be ordered with the same design. 2. Return address would be printed on invitation and R.S.V.P. envelope on request. This design is also available in red color, you can click on the image below to see this red color design.